We have had quite a journey to get to this place, on this night. 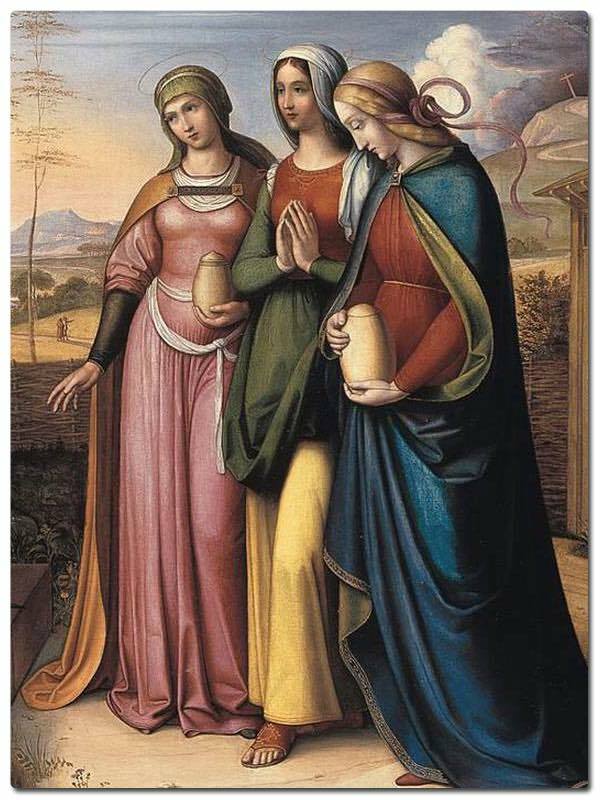 We followers of Jesus, along with all of the characters who populate this amazing story of love, Mary, Joanna, Peter, have accompanied Jesus into Jerusalem with the shouting of Hosannas. We have watched with horror as the events turned violent. We have been implicated in the apathy that allowed Jesus to be condemned and killed. We sat in the silence and waited as we believed with those very first followers, that Jesus, the one who stood for love, the one who healed others, was dead. That was the end. It looked like failure. It looked like the light went out. It looked like evil won. This evening began with the affirmation that indeed the light did not go out. There was flame enough to kindle the new fire, and together we sang it back into a roaring flame. We took solace and strength in hearing stories of salvation history. Reminding ourselves of God's creativity, reminding ourselves of God's liberation, reminding ourselves that God puts us back together again after we have fallen apart. Reminding ourselves of our baptism, when Jesus claimed us as God's own forever, and we were marked as God's beloveds. And here we proclaim the Alleluias. The Alleluias that fill our hearts and our minds with the love of God and each other, the alleluias that ring through eternity, and that shimmer in our own breath and blood. With the words, he is not here, but has risen, Mary, and Joanna, and the other Mary, and all the other women, knew. They knew that this man that they had known in life, defeated death. They knew that this man they had loved, was all that had been promised. The temple would be destroyed and raised in three days, on the third day rise again. They knew what it meant. Jesus was where the God they had worshipped since they were children, lived now. Jesus was where God walked, and loved and healed. Jesus whose body was broken on that cross, now is the one who puts our brokenness back together again. The women realized that death does not have the final word. They knew that it is in dying that there is new life. Our sadness and grief of Holy Week, our brokenness in life, is put back together in this Easter hope. We are Easter people. And like Mary Magdalen, Joanna, and Mary, Jesus’ mother, on that first Easter morning, our lives sing with the love that created us, the love that calls us into being, the love that puts us back together when we break apart, when we miss the mark, the love that changes our very hearts and souls into a new creation. And on our hearts, with the cursive of the healed scars, is inscribed the words, you are loved, broken, healed, love one another. And as Easter people, as people who have been named by Jesus, we are marked and claimed as God's own. Our hearts and our lives are claimed by the love that heals us, the love that puts us back together, the love that wins. And from that love flows the ministry that God calls us to, love one another. Now, Jesus dwells with us, and together we are about the business of kingdom building, as Jesus did and does. It is a kingdom in which all are loved, a kingdom in which all are fed. A kingdom in which mercy and compassion rule. A kingdom in which a broken body makes us whole, a kingdom in which the body of Christ makes us a body of Christ. As we walk out of the doors of this church this evening, our work begins. 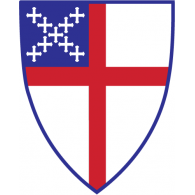 The body of Christ is at work with God's mission of healing and reconciliation in the world. It is our work of bearing God's love to those who, like us are broken, it is our work of bearing God's love in all places and all times. It is our work of feeding those who are hungry, because we have been hungry. It is our work of mercy and compassion, because we know what it is like to miss the mark. We are Easter people. We walk this journey of life knowing the amazement of resurrection, and the pain and suffering that precedes it, and like the women at the tomb on that first Easter morning, we go to tell others. We are Easter people. We are nourished by the bread and the body that is broken for us. We are Easter people, made whole by the love that wins. Alleluia, Christ is risen. I think Good Friday is such a confusing day. Is it a day of mourning, or a day of rejoicing? Is it a day to be sad, or is it a day of forgiveness, love, and compassion? It is all of that. It is time out of time, it is unexpected, in it the system is broken, Jesus is broken, we are broken. What is good about Good Friday? I think what is good about Good Friday is that it shows us the true story about death. That there isn't just one death that each of us must die, but there are many. Over and over we must die to that which is killing us, over and over, to truly be ourselves, we must lay down all that gets in our way of the loving relationship that God desires with us. And that is good, and very different than what the world tells us is good. And it is different for each of us, the stuff that gets in our way, the idols we worship, the dependency on ourselves, security and safety. God says, lay that down, and don't pick it up again. Walk with me, depend on me. 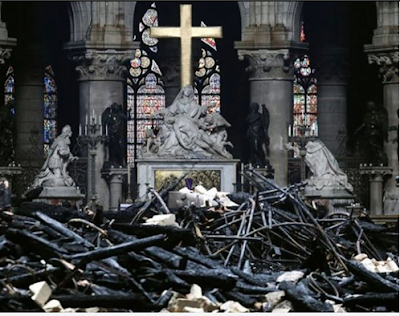 An image that has been before our eyes this week is the flames and aftermath at Notre Dame. In those images, and in the embers, we see sadness at loss, the loss of history, of beauty. But we also see the cross, with mother and child at its base. We see the light shining through. We see hope, because with every death, comes resurrection, new life, new birth. Tonight, we sit in the tension, of life, death, and new life. Watch, and wait. Imagine having been at this particular passover meal. Hoards of people have arrived in Jerusalem for the festival. All clamoring for a place to eat the meal. You, being a friend of Jesus, are in this room, with these people, reclining at this table. Bartholomew, James, Andrew, Judas, Peter, John, Mary, Thomas, the other James, Joanna, Philip, Matthew, Susanna, Thaddeus, Simon, and all the other men and women and children who were gathered that night. The meal is spread before you, the unleavened bread, the roasted lamb, and the bitter herbs. And in the middle of the meal, Jesus gets up, he takes off his robe and ties a towel around himself. One of the people I really miss in our world is Fred Rogers. Recently we’ve had the opportunity to watch documentaries of Mr. Rogers, to learn more about his life. But first and foremost, Mr. Rogers taught us about being a neighbor. Fred Rogers invited a friend of his, in fact someone he had heard singing in church, to be his neighbor on his television show. Francois Clemmons joined the cast of the show in 1968, becoming the first African-American to have a recurring role on a kids TV series. Mr. Clemmons played the police officer on the show. He said he wasn’t really interested in this role initially, because growing up where he did, he did not have a good opinion of police officers. On one episode, Mr. Rogers was resting his hot feet in a plastic pool, and asked Mr. Clemmons, playing a police officer, to join him in resting his own hot, weary, feet. They sat and chatted, as Mr. Rogers did, and eventually the police officer got up to leave and get on with his day, and Mr. Rogers got down on his knees, and wiped dry the feet of his friend. In one fell swoop, Mr. Rogers shows all those watching, who is our neighbor, and how we serve one another. The act of washing feet is sacramental, it is the outward sign of an inward grace. Something that is sacramental, or a sacrament is not beyond or above us, not holier, not necessarily even mysterious. Sacrament is what shows God’s love and grace: ordinary water, ordinary bread and wine, that invite us into love and relationship. In the ordinary meal, our cracks are filled, our fissures healed, we are made whole. In the mundane washing, we overflow with mercy and compassion. Jesus seeps into our very being, washes us, feeds us, heals us. Jesus shows us who God is, and Jesus teaches us who we are, and then we may show that love to others. I have chosen to say a few words at this spot today because it makes more sense to me to talk about Jesus' grand entry into Jerusalem, and then to receive the story of Jesus' passion in silence. Liturgically, we do something very odd here. 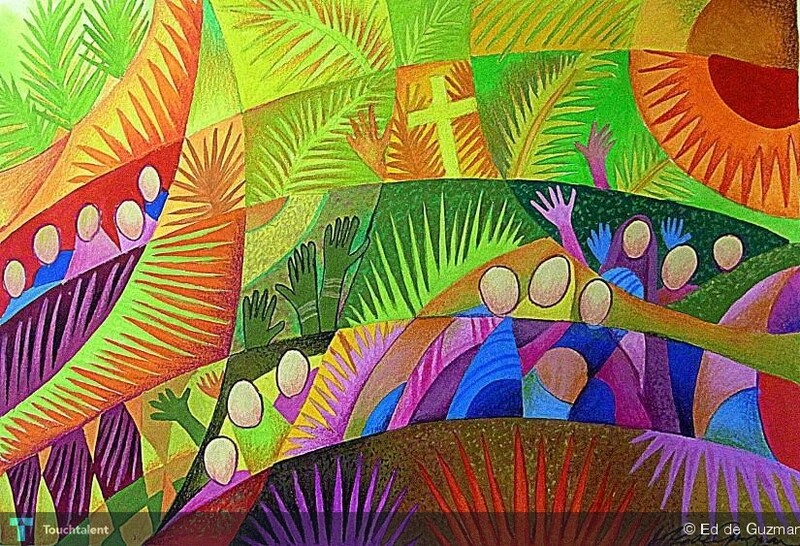 We begin our worship together with waving palms, with the parade, and with Jesus' entry into Jerusalem, and we end our worship in quiet, as we prepare for the unfolding of this passionate story through out the week. Please know that it takes all week to hear this story, to participate in this story, to be able to approach Easter and resurrection. This week carve out time to participate, you all have full lives, but this week, of all the weeks of our lives, is the week to be here. But for this moment, I need to reflect on the Palm of Palm Sunday. Jesus and the disciples and thousands of other pilgrims have made their way to Jerusalem for the Passover. Jesus hailed as a king. Not Caesar, not the appointed Roman governor. But a new king – one for the poor, for those without voices, for those left behind. Jesus is hailed as King, riding on a colt. The disciples welcome him into their city, Jerusalem, and shout "blessed is the one who comes in the name of The Lord – the king of Israel" for now. They lay down their cloaks, holey as they are. And for the time being, we are all willing to follow. But are we also willing to follow into trouble, controversy, trial and death? When we look closely we see the people gathered for this parade, this march, this entrance into Jerusalem. They are not the important and powerful, but the poor and marginalized, maybe even the young, many of them Jesus' disciples. This very important but very brief story shows us that Love does not win by the world's standards. Jesus comes as the fulfillment of the nation's hopes, answering our longings for a king who would bring peace to earth from heaven itself. Jesus brings the peace that surpasses understanding, and much of what is about to unfold in the next few days will be the price he pays to bring it. Jesus’ disciples, of course, have seen things that have changed their lives forever and have raised their hopes. Indeed, our lives our changed. This is not about the powerful Pharisees, grumbling about what will happen if the authorities in Jerusalem think that there's a messianic demonstration going on. From now on we see them no more. It is about Mary, who sang at the beginning of this story, “He has shown strength with his arm; he has scattered the proud in the thoughts of their hearts, he has brought down the powerful from their thrones, and lifted up the lowly, he has filled the hungry with good things, and sent the rich away empty” and cries at the foot of the cross in just a short time. It is not about the powerful or wealthy people of the day, it is about the Kingdom of God in which the last will be first and the first will be last. It is about the woman who anoints Jesus with a very costly ointment of nard. It is about Judas, one of the twelve, one of Jesus’ friends, who makes a choice of power and greed over love. It is about bread and blessing, it is about prayer and emptying, it is about betrayal and it is about love. This is the holiest of weeks. We have prepared ourselves throughout Lent for this journey with Jesus. We come to this Passover festival with Jesus' disciples, we come lean and fit, free of all the stuff that has held us hostage, as that is what our Lenten discipline has done for us. We have carried our own cross with us, by the cross traced on our foreheads, we have remembered who and whose we are. We have left behind that which keeps us prisoner to the world's wants and wills, we have disassembled brick by brick the walls that we had build to shield us from God's love, we have learned about forgiveness, we have been forgiven. We make this journey with Jesus, and revel in the pre-Passover party. Rejoice in this moment. This moment of welcome, when the shouts of "Blessed is the King who comes in the name of the Lord! Peace in heaven, and glory in the highest heaven!” is heard throughout the cosmos. This moment is fleeting. It turns quickly to the terrifying shouts of the crowd, "crucify him."